Evidence of the militarization of the occupied Crimea and direct armed aggression of the Russian Federation against Ukraine has been presented in the OSCE, the Ministry of Foreign Affairs of Ukraine reported. A ministerial-level thematic event was held on the Problem of Militarization of the Autonomous Republic of Crimea and the City of Sevastopol (Ukraine) and Parts of the Black Sea and the Sea of Azov" was held in the framework of the 25th meeting of OSCE Ministerial Council. The event was held with the assistance of delegations and with the participation of the heads of the foreign affairs ministries of the U.S., Canada, Poland, Lithuania, Denmark, Sweden, Great Britain, Latvia, Romania, Georgia and Estonia. 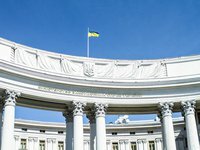 "A wide audience of participants and the media were shown the evidence of militarization of Crimea, which is currently occupied by Russia, and the direct armed aggression of the Russian Federation against Ukraine in the Kerch Strait area, which poses a serious threat to the entire Black Sea region," the statement reads. In their speeches, the partners expressed full support for Ukraine, called for the immediate release of Ukrainian prisoners of war and also discussed possible steps towards deterring the aggressor. "The presentation was of great importance in the context of consideration of the draft resolution "Problem of Militarization of the Autonomous Republic of Crimea and the City of Sevastopol (Ukraine) and Parts of the Black Sea and the Sea of Azov by the UN General Assembly," it says.